The Hylden family immigrated to the United States from Norway in 1865. They had farmed the terrace-like fields on the hills inland from Ulvik, Norway. The small fields and many hills made it difficult for the Hylden ancestors to provide a living for their family. Ole and his wife Anna heard of the vast prairies that were to be found across the ocean in the United States. They also had heard about the New Land, where the right to life, liberty and the pursuit of happiness was written into the constitution. They believed that the government by the people was dedicated to upholding these rights. Seeking to better themselves and their family, they gathered five of their six children and started on their long journey from Norway to the New Country. They sailed down the majestically beautiful Hardanger Fjord to Bergen where they booked passage on a sailing ship to America. After a stormy 5 week crossing, the immigrants finally arrived at the Port of Entry to the United States of America. They traveled inland and first settled in Iowa. While in Iowa, more children were born to Ole and Anna. The lush green hills of Iowa became dotted with cabins and barns, but the settlers started talking of a new land…the Dakotas. After church on Sunday, the men would gather and talk of Dakota…the land of promise, a prospect, a new horizon…a place where they would give you land if you had the endurance and determination to work it and live on it for two years. Mikkel Hylden (Ole and Annas son), his wife Brita and their children made the decision to move to the Dakota Territory. In the later part of March in 1881, the family packed up all its worldly goods and started north. Mikkel and Brita arrived in Grafton, Dakota Territory, later that spring. Leaving Brita and the children, Mikkel walked the land, searching for a fertile valley with rich black soil. On a cold, windy spring day, Mikkel entered a golden valley, which would later become known as Vernon Township. It was here that he found the soil and land that had been his dream. Together Mikkel and Brita selected a site for their cabin, and started to chop down trees for the construction of their new home. Their cabin consisted of one room, open on the south side. The roof was made of sod and wood slashings. Mikkel and Brita worked hard to open the land and expand their farm. In their first year of planting, they only had one ox, so they would take turns pulling the breaking plow hitched to the ox. Mikkel and Britas hard work paid off, as their farm gradually grew to provide both a comfortable home and a profitable business. Together, they raised a family of 9 children. Their son David continued the familys heritage of farming. He grew prize-winning grain on the land that his father had settled. In the 1930s his grain won first place at the Chicago International Grain Show. The Golden Valley of North Dakota continued to provide a family living for three of Davids sons, Mike, Duane and Don. They expanded the farm into a dairy business, producing Grade A milk for the community. Hylden Farms continues into the fourth generation of farmers. Mark, son of Don and LaVonne Hylden, and his wife Esther started farming in 1979. In 1982, Mark received the Young Farmer and Rancher of the Year Award for North Dakota, as awarded by The American Farm Bureau Federation. Mark and his father, Don, continue to operate their portion of Hylden Farms. Their farm produces hard red spring wheat, soybeans, sunflowers and Golden Valley Omega Flax. Mark and Don seek to preserve their rich heritage of excellent farming and strong work ethic as they work together, with Mark and Esthers sons, to produce the best flax crop possible. Esther Hylden is a Registered Nurse, with 39 years of experience in health care. A few years ago Mark and Esther came to realize that flax was more than just another crop to grow in their rotation. Esther and Marks family health history included close family members with diabetes, colon and breast cancer, heart disease and elevated cholesterol. As they explored health promotion activities to follow in order to prevent these many diseases, they noticed that flax kept coming up in their research. It was not long before Mark and Esther were absolutely sold on the health benefits of flax. After adding flaxseed to their diet, and noticing its positive effects, they determined to share this little seed with their family, their friends, and with the world. 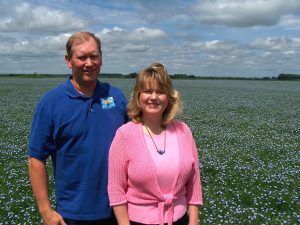 Calling upon their rich farming heritage and health expertise, Mark and Esther are committed to producing the highest quality flaxseed and making it available to those people who share their interest in obtaining their best possible health.